Inspired by the Old World and influenced by the New, this is month-long event celebrates the sounds, sights and scents of Christmas. 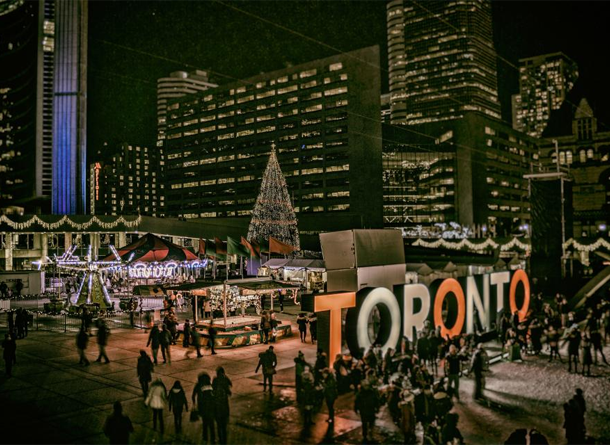 Set in the Victorian-era, cobblestone-lined Distillery Historic District, the Christmas Market brings together local craftspeople, musicians and artisanal food-makers for a truly festive experience. Sip on mulled wine and European Christmas cocktails as you peruse the selection of hand-made ornaments, wood carvings and crafts. Then cozy up by the fire or take in carollers, brass bands and authentic European dancers. The 2018 iHeartRadio Jingle Ball returns to the Scotiabank Arena in Toronto on December 2nd! Join us for an exciting night of performances by The Chainsmokers, Khalid, Dua Lipa, Alessia Cara, Loud Luxury, Tyler Shaw, Lauv, bülow, MAX, Delaney Jane, Elijah Woods x Jamie Fine and more to be announced. Happy to be back at the Polish Combatants Hall for the third time! Our monthly talk show with special guests: 2018 Polaris Music Prize winner Jeremy Dutcher, journalist Anupa Mistry, and rapper Lee Reed! Plus, sidekick James Keast and house band The Bicycles! A hilarious holiday musical for all ages! The North Pole is thrown into chaos when one of Santa’s most trusted elves goes rogue. To get the holidays back on track, Santa will need the help of some of the naughtiest children ever. The Second City is proud to present The Naughty Listers – a hilarious mix of puppets, live action, and song that all members of the family will enjoy. Even the naughty ones. By Order of The Phoenix all Toronto Witches & Wizards are cordially invited to celebrate a Magical Evening at The Phoenix Concert Theatre on Thursday the 20th of December. We are delighted to host this years Yule Ball for all magical beings in Toronto. Dress robes and all things magical are encouraged for this formal Yule Ball magic & dance event. Pupils will be entertained throughout the night with musical performances as we transform our venue into a magical wonderland. The drinkers were nestled all snug in their sweaters, While visions of ales and sours made them feel better; All the 19+ kids in town squealed with delight, The Gladstone Hotel’s providing our favourite night cap!